Definition at line 35 of file transport.hpp. Definition at line 47 of file transport.hpp. Definition at line 48 of file transport.hpp. Definition at line 36 of file transport.cpp. Definition at line 43 of file transport.cpp. 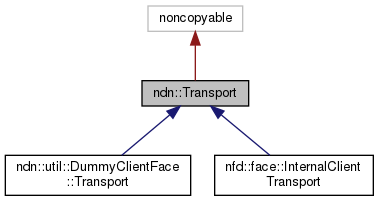 Implemented in nfd::face::InternalClientTransport, and ndn::util::DummyClientFace::Transport. Definition at line 121 of file transport.hpp. Definition at line 127 of file transport.hpp. Definition at line 133 of file transport.hpp. Definition at line 115 of file transport.hpp. Definition at line 116 of file transport.hpp. Definition at line 117 of file transport.hpp. Referenced by connect(), ndn::util::DummyClientFace::Transport::receive(), receive(), and nfd::face::InternalClientTransport::receiveFromLink().